When most people think of the animals that live in polar regions, they think of polar bears or penguins. And although penguins are pretty cool, they are only a part of the amazing diversity of marine birds that make their home at the poles. Tens of millions of seabirds migrate to the Arctic and Antarctic each year from more equatorial non-breeding grounds. Seabirds spend their entire lives at sea, returning to land only to breed. Some species, like the thick-billed murre, actually return to nest within only a few meters of where they themselves were hatched. Below you can see a young thick-billed murre on the ledge where it was born (on the left), and an adult thick-billed murre that has returned to the colony where banded. It has a coloured band (specific to a series of years), and a metal numeric band (unique to that bird), which can tell us how old it is, and where it came from. 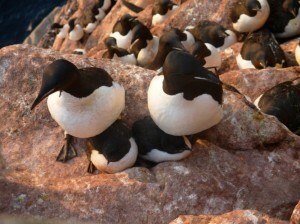 Thick-billed murre parents stand over two young chicks (Photo: J. Provencher). 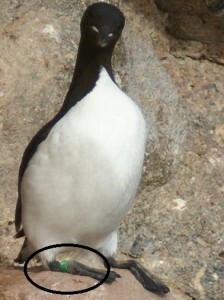 A banded thick-billed murre with a green band and a metal band (Photo: J. Provencher). Banding birds may seem like an old fashioned type of science but, through banding efforts, we get clues about how the environment is changing and how the birds are affected. In the Arctic, long-term studies of thick-billed murres have shown that changing ice cover is leading murres to switch from eating the ice-associated Arctic cod to eating a warmer water species, capelin. While monitoring banded birds throughout the time period when this diet shift has occurred, we also gain knowledge about how these shifts affect bird survival, and the persistence of the bird colonies. In polar ecosystems, changes affecting plants and animals are not the only thing that seabirds can be used to study. Marine birds can tell us about micro-contaminants, like chemicals, and macro-contaminants, or plastics in the environment. 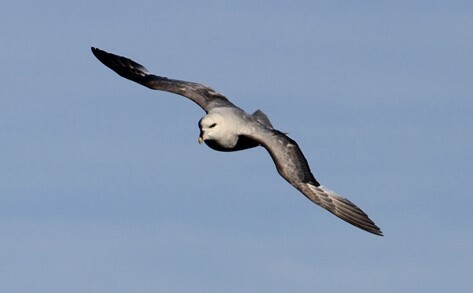 For example, northern fulmars are used as indicators of marine plastics pollution. This approach is now used in many regions (see the North Sea program here), including Arctic Canada. Fulmars are collected and examined for ingested plastic debris. One sure sign that plastics released into the world’s oceans are making their way into Arctic waters is the presence of industrial plastics (the raw or unprocessed nurdles or pellets) in living Arctic northern fulmars. In the southern hemisphere, seabirds are also being used to study marine plastic pollution. Thin-billed prions, a species similar to northern fulmars, ingest all types of plastics. You can learn more about what types of plastic prions are eating, and how you can help reduce the amount of plastics in the ocean, at the Museum of New Zealand’s The worst type of Junk Food. A northern fulmar soaring above Prince Leopold Island, Nunavut (Photo: J. Provencher). 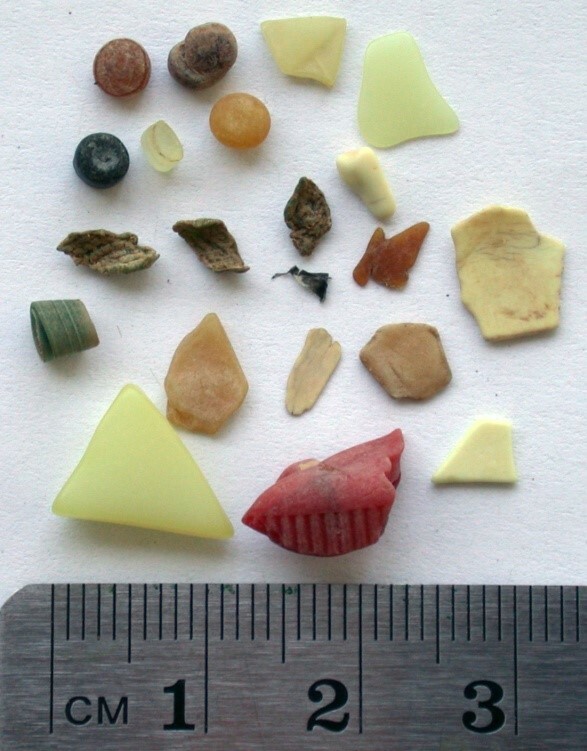 Plastic debris found inside a fulmar from the Canadian Arctic, including five industrial pellets in the top left corner (Photo: J. Provencher). We can also learn a great deal about chemical contaminants from seabirds. Female birds not only use their own protein and fat when they make eggs, but they also incorporate a portion of their own contaminant burden. In some places, ivory gulls make a living by following around polar bears and scavenging on the scraps of seal the bears leave behind. 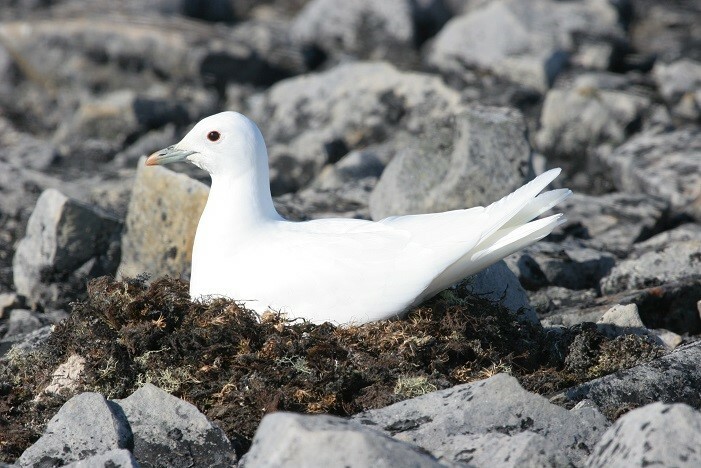 Finding ivory gulls is a bit of a challenge, as they tend to nest on remote nunataks, which are exposed, snow free areas of rocks on mountain sides. However, a team from Environment Canada and Carleton University has been sampling ivory gull eggs since the 1970s. Ivory gulls spend their entire lives in the remote Arctic, far from industrial sources of mercury. This means that any chemical contaminants they have picked up have been transported to the Arctic by atmospheric or oceanic currents. Finding man-made/released chemicals in this remote species illustrates how chemicals that are made and released in urban temperate areas don’t stay there. An ivory gull on its nest (Photo: Mark Mallory, used with permission). The combination of many factors – including their almost exclusive marine existence, their longevity, and their colonial nature – make seabirds a great indicator group to study long term changes. Their use of the marine environment makes them one of the few groups we can access from land that can give us information about marine ecosystems. Their wide geographical ranges and diverse ecological niches make them particularly useful for examining patterns in environmental systems over space and time. The fact the seabirds are relatively easy to track and find because they often breed in large colonies also helps in long term studies. Studies tracking and monitoring seabirds over time have lead to insights about changing fish and zooplankton populations, and contaminant levels across the world’s oceans. With polar amplification of changing climatic conditions, we are reaping the rewards of polar seabird studies that were started decades ago, and are now being used to answer questions about how the poles are being affected by warming conditions. Arctic seabirds are canaries for the early warning signs of shifting ecosystems as the poles warm faster than other regions of the globe. APECS, Guest Authors APECS, Arctic, climate change, environment, ivory gull, Jennifer Provencher, murre, polar research, polar week, seabirds. permalink.